Small amount of Naturally Fur & Merino in red from the stash because I was a little generous with the cuff length and ended up 5 rows and a thumb short on each mitt. It coordinates nicely. Spinning Notes: I split the sliver lengthwise before spinning then made sure to spin starting from the same end. 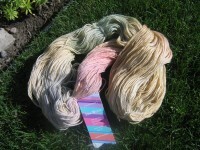 I hoped that the colours would roughly line up so that I could keep the colour changes in the finished yarn. It worked, sort of. While the colours didn't exactly line up, there is certainly a clear progression of colour change and they do roughly match. I'm very pleased with the look. 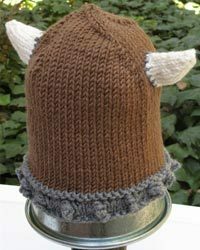 I was just plain tired of knitting this thing. It's a great pattern - easy to memorize and really quite quick to knit (if you work on it). The lace panel here was the inspiration for my Sockapalooooza socks. I have 1 ball of Rowan Calmer left That ball wouldn't have made the difference between tunic length and dress length so I decided to wrap it up early. I'm thinking that I can make a version of a One Skein Wonder (Glampyre Knits) to cover Dragonsdottir's shoulders and let her wear this tunic through the fall. 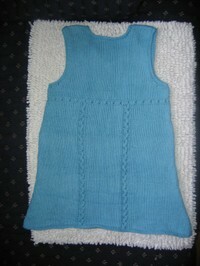 By next spring, I expect it'll fit my niece as a dress. As I was looking for the link to Jan for you, I came across this shrug too...I'll bet it would work if I did the math for the different gauge. 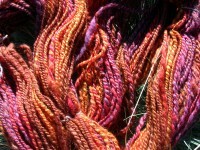 This pretty skein reminded me of the colours inside a shell. Pale, shimmering pink, blue, and green with a neutral sandy base. 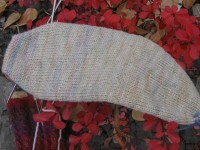 I thought it would be perfect for lace socks and chose Wendy's free pattern for Double Eyelet socks. It's a very easy pattern to memorize and it's toe-up, allowing me to use every scrap of this gorgeous yarn. By the way, it's Fleece Artist Sea Wool. Yummy. Clicking on the pics, especially the sole, will let you see the subtle variegation in the colours. This yarn is gorgeous. the Sea cell gives a lustre and hand to the wool which is very much like silk. The sheen reinforces the feeling of knitting with mother of pearl. Maybe that's what this colourway should be named... mother of pearl....lustrous, smooth, silky, with subtle colour glowing in the light. Have I been on a downer lately or what? Geez! Should have been a clue to me that I was getting run down and heading for a crash. At first, I blamed feeling ill on the dental assault. Then just on simple fatigue and maybe a bit of stress. I cooked Thanksgiving Dinner on Sunday, instead of Monday because that just worked better for me, and we had company over. The house wouldn't have been picked up if the Hub hadn't done it. By the time Africa and C and their daughter left, I was ready to fall over. Monday I couldn't move not even to knit. Tuesday I couldn't move but I picked up Claire's dress/tunic (Jan, remember?) and finished it. Finishing involved garter edging for the arms and neck and about 10 rounds on the skirt. Took me 5 hours. Wore me out. Total UFO's left in my basket... 1 shawl and about 3 single socks looking for mates. That's it. Wednesday I got dressed. Whoppee! An hour out to watch Dragonsdottir swim had me laying on the couch again. I knat a dishcloth. Thinking it might help, I kept my massage and chiropractor appointment. Holy Crap! The new massage therapist is STRONG! Chiro Doc took one look at me and said, "You look awful." Yeah. He did my adjustments and then pointed out, "You're hot!" (I snickered, he got flustered. It's so cute.) Indeed I was, once again flushed with fever. "You're staying home for the rest of the week." he said, somewhat sternly. Ok... I know he's not an MD but I don't think it takes one to see that a continuing fever and cough don't mix well with a teaching environment. I've taken the rest of the week off to get better and I'm trying not to think of the week I have coming to me as a result of getting NOTHING done this week. I work with the best team of teachers there is, and they've got my back. I know that I need to rest if I'm going to get better so why do I feel so damn guilty about it? Thursday... 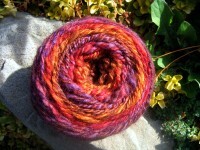 I'm going to wind some sock yarn. 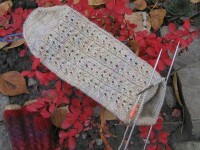 And I'm going to swatch for the Tangled Yoke Cardigan using some oatmeal coloured dk weight merino I have in the stash. Friday... More of the same I expect. Except that I might cast on for something. My most wonderful, spectacular, gorgeous, kind, friend Charity has some exciting news! Go congratulate her. 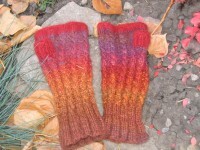 And finally, I've made it onto Ravelry. There's not much to see from me right now. My camera is at school (which explains why there isn't a pic of my dishcloth, or the finally finished Jan, or the incredibly gorgeous handspun handwarmers). You can still say hello to me if you're a Raveller though - I'm KnitTwoTogether. That's it everyone. Take it from me - rest, relax, be healthy...and knit something just for the hell of it! If you've been reading for a while you might remember my last adventure in dentistry. Go ahead... remind yourself of my last trip to the seventh level of hell. I'll wait. I need a fresh ice pack anyway. A month or so ago I went back in for a routine cleaning. I'd been noticing that one of "those" teeth seemed to be unusually sensitive again. An x-ray showed that one of the new inlays had broken off a corner. It needed to be replaced. I looked at the very sweet, kind, gentle, considerate hygeinist and responded with a muttered curse (yes... I used the F word. No.... not all that creatively.) She agreed with me. 8:30 am... I am guided into the Bowels of Hell, and given a bib. 8:32... I am stabbed in the face, twice, by the Chief Demon (disguised as a kindly grampa dentist) but not until I confirm that there is not a drop of epinephrine in the anaesthetic. 8:40... I have assumed my stroke victim disguise, complete with droopy eyelid, numb nose, and fat lip. The Chief Demon smiles and tells me, with some excitement, that they've got this really amazing new ceramic material that's so much better than the other stuff. yay. 8:41... The drilling begins. High speed diamond tipped bit. Pulverized porcelain tastes putrid. There is an alarming crunching sound and the drilling stops to be replaced with picking and a muttered comment about the ceramic being broken right through... no wonder this tooth was sore! The drilling continues for quite some time. My tooth begins to feel cold. Cold stabs through my upper jaw making me flinch hard. I am gently stabbed again and work resumes. The last little bit is accomplished by a laser and hurts enough to bring tears to my eyes. The Chief Demon comments to his Demonic Assistant that he's surprised even the very gentle laser hurts; the tooth is awake; he doesn't like the plain anaesthetic. 9:30... I am allowed to sit up. The remaining bit of my tooth has been painted with desensitizer and a mould has been taken. They will mill the fabulous new ceramic inlay while I relax for an hour. Thank goodness I have brought my knitting. Progress is made on my handspun fingerless mitts while the last of the anaesthetic leaves my face. 10:45... The very, very gentle drying of my tooth with a piece of gauze once again brings tears to my eyes. The Chief Demon shakes his head as he snaps the inlay in place for a dry fit and the tears threaten to spill over. The last time he did this, he was able to install the inlays without any further anaesthetic but not this time. This time it is far too much. He stabs me again. It hurts. A bit of liquid flows onto my tongue. I gag at the bitterness but can't tolerate the water rinse either. We wait just a couple of minutes but the gauze is still very painful so another shot of anaesthetic is needed. 10:55... I am finally numb enough to proceed. I can't feel the tooth but my face sure hurts. At this point, I am more than a little sick to my stomach. The Kindly Grampa Dentist is at his most gentle now. He is being so very careful not to cause me any more pain. He bonds my tooth under the inlay to give the tender nerve as much protection as he can then installs the ceramic. 11:15... Done. At last. I feel like I've been hit by a truck. I want nothing more than to collapse in tears. Instead, I stop at Tim Horton's and pick up coffee for my colleagues on my way in to work. I taught spinning to ninth graders again today. I love this lesson. It's so much fun to see them with spindles trying to figure out how to do something which, to their eyes, looks so easy. I don't let on that I'm really not very good. They don't need to know that. They have fun and learn an important perspective on history at the same time. They think it's cool that I can spin and they ooohhh over the handspun mitts in progress. The last period of the day was a spare and I left early, just too worn out to think. Now that I've had a nap, and something to eat (the first today), I feel partly human again. Tomorrow is a non-instructional day so while I have a ton of work to do it's not the same high energy level that I need to maintain for working with kids. Then it's the long Thanksgiving weekend. I'll post sometime over the next few days and show you the mitts, and maybe some of my famous pumpkin pie. Oprah says that parenting is the hardest job that anyone ever does. I think she's right. Parenting is tough, and I had a bad day Sunday. Thanks everyone, for all of your very heartfelt words of support. Thanks even more to Phil. His comment made me stop and be thankful, and that's really what I needed to remember. Take a minute to go read his comment on yesterday's post. Meanwhile... The Husband made supper, the kids helped with the dishes, the laundry is done and so is the homework. No one is fighting. The dog is sleeping on my lap unmolested and Dragonsdottir is sitting next to me playing with her paper dolls. There is mild bickering but it's quiet and more or less humourous, no squeaky inane tv, and no urgent chores that require my attention. I am spending some quiet time with the family before the parade to bed. 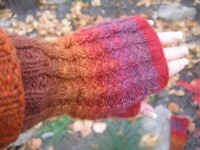 I may even get to finish that handspun handwarmer!